The twinning project set up by the Diocese of Brentwood Justice & Peace Commission has established a twinning arrangement between its parishes and the parishes of the Diocese of Dundee in South Africa. Our parish, The Holy Family & All Saints Witham, has been twinned with the parish of Dannhauser. Money is raised through a number of events during the year. The main fundraiser has been an annual parish BBQ, the dripping tap donation box in the main foyer of the Church, the regular coffee mornings following the 11.00 Mass, to which you are all invited, and individual donations. Donations, however small, are always welcome. Those small bits of loose change soon mount up. Dannhauser is located midway between Durban and Johannesburg on the main railway line. Dannhauser functions as a small rural service centre and relies on the larger urban areas of Dundee and Newcastle for employment opportunites and higher order goods and services. Please pray for Fr Andrew and all the people of our twinned parish as we continue to support them financially. Fr Andrew spent a few weeks with us from 11-30 June 2016. He sent this message to the parish. "Thanks for the lovely time and the friendship during my visit. I have shared the fond memories of my visit with the parishioners over here. 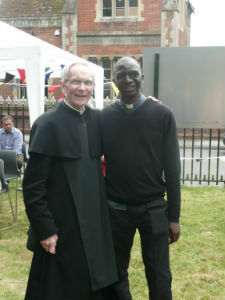 They are all excited about the friendship between the two parishes. " 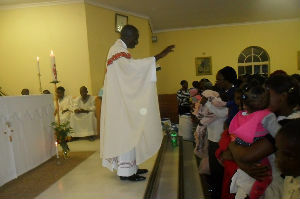 Fr Andrew was appointed parish priest of Ladysmith in August 2017. We wish him much joy in his new ministry.